meet little miss Leigh, my secret treasure for the past few weeks. she didn't look like this when she first arrived. So far she has had two baths, three hair treatments, some eyeball dermabrasion to remove jaundice, and lip repaint. I'll probably repaint her lips again, I'm not happy with it yet. Oh and I don't plan to announce her on TIB so it's just for everyone here. =) Huge dolly thanks to Melissa, Sandy, Paula, Karen, and Erin for their generosity and for sharing invaluable tips. Leigh ♥s you! 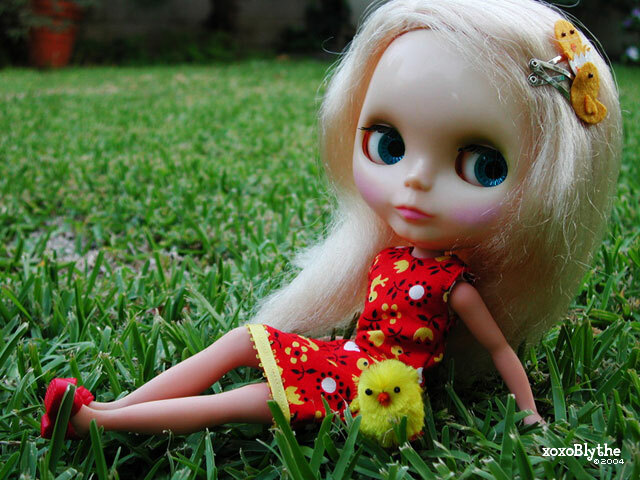 and yes, I am the person who bought the Spring Chicks outfit from Miss Dandy. I know, I'm a lucky lucky bum. My bank account balance certainly doesn't look it... >_< but golly, I go totally gah-gah when I even think about my little Leigh. It's been three weeks now and I still can't stop staring at her. is it possible to be in love with a dolly? The husband and I decided to make some dolly bracelets out of seed beads for fun tonight, hehe. that's right, real men bead! ;) the purple one came out so cute that I had to find this outfit to match. 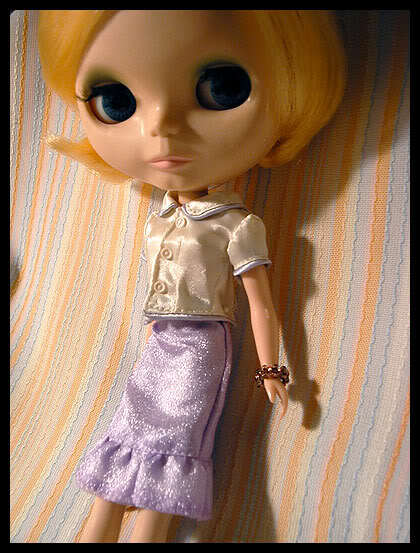 I didn't make the outfit (obviously), it's a Zodiac Girlz set that I got at KB Toys - the skirt and shoes fit PERFECTLY but the top was way too small, so I had to doctor it up a bit. as long as it looks good from the front, right?